Don’t get locked into long term contracts! For ultimate control of who can enter what part of your building – and when, you can’t beat an access control system. You can even get a report of who entered what door and when they did it. You can give people access to specific doors, and restrict the timeframe during which they have access. If someone looses their card, leaves the company, or moves out of the building without returning their card, the building security is not compromised as with a key system. You simply program their card as invalid so that it will no longer get them access to the building – but it will show up on your report if they try to use it. You can also integrate an access system with your burglar alarm system. You could arm and disarm your alarm system using your card (or fob) instead of entering an access code at the keypad. We have even designed systems for larger buildings which never need to be armed or disarmed manually – it is all completely automated so that authorized people (with a valid card or fob) can come and go as they please, while an unauthorized person trying to enter the building will trigger the alarm. This is particularly helpful in large or multi-floor buildings where the last person to leave isn’t sure if they are the last person or not. This can result in either arming the system while someone else is in the building, causing a false alarm when the person moves around, or the building not being armed for the night or over the weekend. Typical card/fob readers. 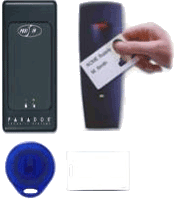 A card or a fob is placed close to the reader to gain access. Cards are credit card size, and fobs are quite small and go on your keychain. Electronic keypads can also be used to gain access. They can have several codes programmed so each person can have their own code if desired. This system can be programmed to accept either cards/fobs or codes; or it can require that both a card and code be used to increase the level of security. Get rid of one more key on that ring by installing digital pushbutton locks for your home. They come in a variety of colours, and have a key backup just in case you forget your code. How many doors need electronic access control? How many people will need access (think of the future as well)? Would I prefer to use codes or cards/fobs? Do I need reports of who entered what door when? Will I need to be able to restrict people to certain doors and/or certain timeframes? Is there a possibility that I will want to expand the system to more doors later? Do I need the ability to access programming remotely – from other computers on the network or from a different location? Would I like to integrate access control and my burglar alarm system so that they work together to simplify procedures? #lowvoltage #dooroperators make service easier. No need for expensive #electrical work. #aoda is coming. http://www.hbsecurity.com/technology-progression-locks/ #newstuff #oldstuff ... the two aren't so different. #researchishard but totally worth it. #motiondetector #glassbreak it's really a user preference. If you know your application, we can provide the best solution. #security for #waterlooregion and all it's surrounding areas. Leaving your #home unattended can be disconcerting. #videosurveillance watches while you can't. So you #alwaysknow . H & B Security Centre © 2019. All Rights Reserved.